After much consideration we decided to head to Goodwood Park Hotel for their English High Tea Buffet. FYI, their High Tea Buffet starts at 2PM and ends at 5.30PM on weekdays, costs $45++ per person. so I was very surprised with the wide variety of pastries and sandwiches they've got there. The pretty setting makes everything look a little more appetizing. I didn't try most of the tarts because I don't eat quite a number of the ingredients used (Smoked Salmon, Tuna, Brie Cheese..), but I think the other girls were having fun! You can choose from the Crabmeat with Tobiko and the classic Ham & Cheese. 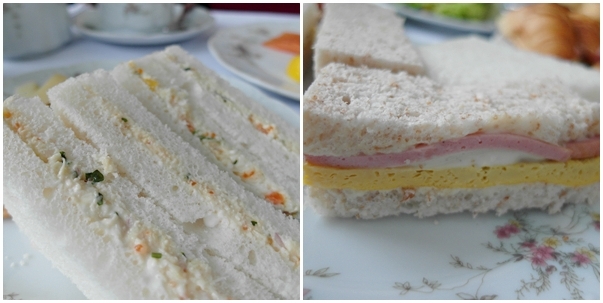 They had at least 5-6 types of sandwiches to choose from and they all tasted pretty good! before we were off to catch Jack & The Dragon Slayer!